WSU men’s basketball coach Scott Nagy was named NABC District 12 Coach of the Year. KANSAS CITY, Mo. 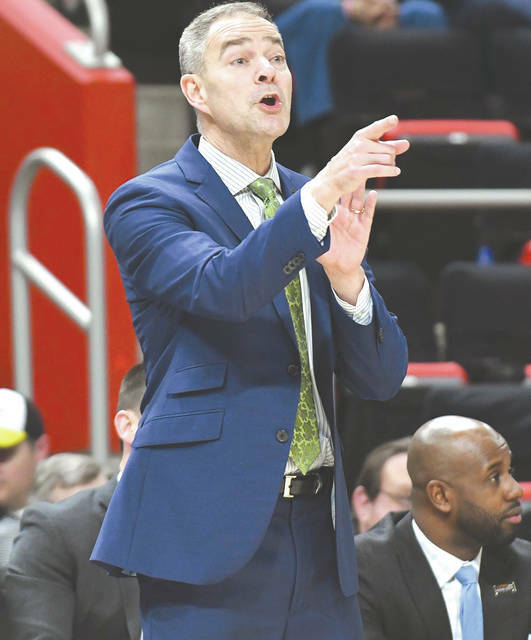 — Wright State University men’s basketball coach Scott Nagy has been selected the District 12 Coach of the Year by the National Association of Basketball Coaches. Nagy, in his second year as head coach at WSU, led the Raiders to a WSU Division I record 25 wins and the school’s first NCAA Tournament appearance since 2007. Wright State finished second in the Horizon League, posting a record 14 wins, and won the post-season tournament with wins over Green Bay, Milwaukee and Cleveland State. The Raiders advanced to the NCAA Tournament where they fell to Tennessee. The 2018 Horizon League Coach of the Year led South Dakota State to three NCAA Tournaments prior to coming to Wright State. District 1 — (American East, Metro Atlantic) John Becker, Vermont / Kevin Baggett, Rider; District 2 — (Atlantic Coast) Tony Bennett, Virginia; District 3 — (Atlantic Sun, Big South) Mike Jones, Radford; District 4 — (Atlantic 10) Dan Hurley, Rhode Island; District 5 — (Big East) Chris Mack, Xavier; District 6 — (Western Athletic) Travis DeCuire, Montana; District 7 — (Big Ten) Chris Holtmann, Ohio State; District 8 — (Big 12) Bill Self, Kansas; District 9 — (Big West, West Coast) Mark Few, Gonzaga; District 10 — (Colonial Athletic) Bill Coen, Northeastern; District 11 — (Conference USA) Steve Henson, Texas-San Antonio; District 12 — (Horizon, Summit) Scott Nagy, Wright State; District 13 — (Patriot) Steve Donahue, Penn; District 14 — (Mid-American) Nate Oats, Buffalo; District 15 — (Mid-Eastern Athletic) Jay Joyner, North Carolina A&T; District 16 — (Missouri Valley) Porter Moser, Loyola Chicago; District 17 — (Mountain West) Eric Musselman, Nevada; District 18 — (Northeast) Bashir Mason, Wagner; District 19 — (Ohio Valley) Matt McMahon, Murray State; District 20 — (Pac-12) Mike Hopkins, Washington; District 21 — (Southeastern) Rick Barnes, Tennessee; District 22 — (Southern) Wes Miller, UNC-Greensboro; District 23 — (Southland, Southwestern Athletic) Donte Jackson, Grambling; District 24 — (Sun Belt) Bob Marlin, Louisiana; District 25 — (American Athletic) Kelvin Sampson, Houston.